In a short five years, Dropbox has gone from 0 to 100 million users. What’s even more impressive is the fact that they’ve done it with one of the most simple website designs ever. Since the first year, their homepage has featured only two main components – an explainer video and a download button. They’ve also grown without spending money on advertising, and they’ve grown exponentially compared to the competition, despite the fact that there are dozens of similar services competing in the same space. So what’s Dropbox’s secret? How did they grow so quickly with such a simple design, one explainer video, and spending no money on advertising? Dropbox started out by using Google AdWords as a way to reach customers. But they quickly figured out that they were spending $233 to $388 per customer acquired. That ended up being too expensive for what was a $99 product at the time. Thus, they decided to switch to a viral referral campaign to attract more customers. This ended up being one of the keys to their success. 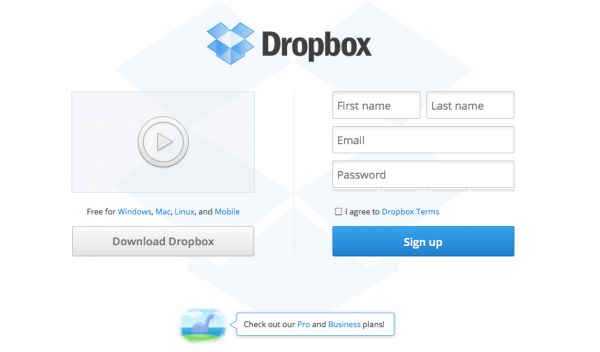 Here’s how it worked: Dropbox users were encouraged to share the service via social media and email. If they did, they’d get extra space for free on their own account for every new person who signed up from one of their invites. The result was that satisfied customers became brand evangelists who helped to get the word out about Dropbox. Due to the fact that they’d get something in return, i.e. free space, users liberally shared about Dropbox via Facebook, Twitter, email, and more. For every customer who was satisfied about the product, there were hundreds and even thousands of other people who were finding out about it and signing up. This resulted in a total of 2.8 million invitations being sent out over a 30-day period. What an awesome viral campaign. It’s one of the greatest of all time, and Dropbox fully leveraged the power of referrals and social sharing. But that’s not all that they did. Dropbox’s simple homepage design focuses visitors’ attention 100 percent on their explainer video. There aren’t any other links or any other messages that get in the way. When you land on the homepage, there’s only one thing to do – watch the video. By focusing every visitors’ attention on the explainer video, Dropbox was able to get more people to watch and learn how the service worked. This in turn led to more sign ups because more people now understood how to use Dropbox. It’s a lot easier to click a download button when you know how something works and understand the benefit, and that’s what Dropbox was banking on with their 120-second explainer video. The result was a 10 percent increase in sign-ups. That’s right – the explainer video led to a 10 percent increase in conversions. That may not seem like much, but when you do the math with 100 million users, that’s 10 million extra customers simply from using an explainer video. With an estimated $4.80 of revenue per customer (based on estimates from 2011), that’s an extra $48,000,000 in revenue per year. Not bad for a “mere” 10 percent increase in conversions. According to a study conducted by Forrester Research in 2009, one minute of video is worth 1.8 million words. It makes sense, when you think about it. If a picture is worth a thousand words, then a video should be worth a couple million at least. Companies that don’t embrace video will need to hire a lot of writers. Based on research from Internet Retailer, product videos increase the likelihood of a purchase by 85 percent. Additional research showed that product videos gave 52 percent of customers more confidence in their purchase decision. Using the word “video” in an email subject line has also increased open rates 13 percent and click-through rates over 92 percent. Based on another Internet Retailer study from 2012, 46 percent of people will share a video on Facebook, and 40 percent will email links. How’s that for conversion-rate optimization and viral social sharing? Simply put, our brains are hardwired to respond to videos. Not only are most people visual learners, but people retain 68 percent more information from video than from plain text. By using video, which stimulates both visual and auditory senses, you’ll make sure that customers understand your business 68 percent better than if they’d only read plain text. Dropbox increased their conversion rate 10 percent by using a simple explainer video on their homepage. This 10 percent increase led to 10 million additional customers and $48,000,000 in extra revenue. This was all done with a 120-second explainer video that cost less than $50,000. Was it worth it? Well, a $50,000 in exchange for 10 million customers and $48,000,000 in revenue is quite a return on Dropbox’s investment. If you have a business website and a product, I strongly suggest you consider investing in a simple video too. You may not see numbers in the millions like Dropbox, but you will increase conversions radically with a clear, effective explainer video. Andrew Angus is an author, speaker, and founder / CEO of Switch Video, a video animation company that produces simple videos that “explain what you do” in an engaging and compelling format. Andrew is a thought leader in the online video industry, writing and speaking about the brain science behind making your company’s story stick. He welcomes people to reach out to him on Twitter or Google+ and can be booked to speak on Speakerfile.